The Yowza Fitness Osprey treadmill is a solid and durable machine for not a lot of money. Its unique Tranformer frame design allows it to fold up to only 24×33”. This compact design is perfect for runners with limited space in their homes. Compared to some other folding treadmills on the market, this is a solid and stable machine and a good buy for the price. The Yowza Osprey is manufactured by GreenMaster in China and Taiwan. This company has been making great machines for over 25 years and is well-known for few, if any, maintenance issues. Unfortunately, the company has changed quite a bit in the last few years and it’s unclear if they will be sticking around for long. You may want to go with another folding treadmill from a more stable company. We were pleasantly surprised by the comfortable shock absorption on the Osprey and feel comfortable recommending it to those who need a reliable running machine for their smaller homes. Also check out the other Yowza folding treadmills: the Lido and the Sebring. NOTE: We’d recommend you check out the ProForm Power 995i for another folding machine. The Yowza machines fold up smaller than most other options, but we’re not confident in the company at this point. 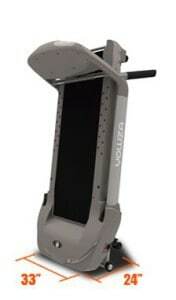 Compact Design- The Osprey treadmill has a Transformer frame those folds up to only 24×33”. 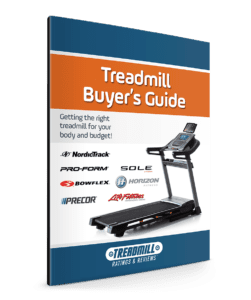 Unlike many other folding treadmills, this machine can truly be “put away” when not in use. We were impressed by its folded size and mobility. It is a stable machine that provides a comfortable experience for runners. Intelligent Weight Management —The Osprey comes with a scale that measures your weight and body mass index. Data from the scale is wirelessly transferred to the Osprey so that the machine can adjust the speed and incline to maintain your target weight. It works in conjunction with the user profiles. Basically, IWM is a form of weight management free from guesswork. 2.75 Continuous Duty HP Motor — This machine has sufficient power so that it will run effortlessly for both walkers and runners. It comes with a lifetime warranty, which tells you there are rarely any problems. 20″ x 52″ Treadbelt — The belt on the Yowza Osprey tends to be shorter than many treadmills in this price range. We would probably not recommend this treadmill for anyone over 5’10” if you plan to use it for jogging or running. Speakers with MP3 Input — The sound from these speakers is better than most cardio equipment in this price range. 9 User Profiles and 16 Workout Routines — There are nine individual user memory slots that can record user’s age, weight, and fitness level. There are sixteen workout programs that include interval training, weight loss, distance training, and heart rate control. You also receive a wireless chest strap with your purchase. Console Features – The Yowza Fitness Osprey treadmill has a sturdy console with plenty of storage space for items like baby monitors, water bottles, or phones. The machine goes up to a speed of eleven mph and has twelve levels of powered incline. Warranty — Lifetime motor and frame, 5-year parts and 2-year labor coverage. This is above average for a treadmill in this price range. We like that the Osprey is a solid jogging/running machine for not a lot of money. In fact, it is probably the most stable machine in its price range. Our favorite features include the IWM capability and small 24”x33” size when folded. The company Yowza seems to be a bit shaky at this point. You may be better off buying a low priced folding machine from ProForm instead.